Drip Tip 510 Eclair Wide Bore, Acrylic and 510 Standard. This drip tip with an opening of 13mm ameliorates the production of vapor. Adapted for clearomisers and atomisers of 510 Standard. A handsome drip tip in Acrylic with a mouthpiece of 13mm in diameter for a good production of vapor. The base is in Delrin to isolate the heat. The aeration is increased gracious to the lightning engravings. It equally modifies the look of your Electronic Cigarette. 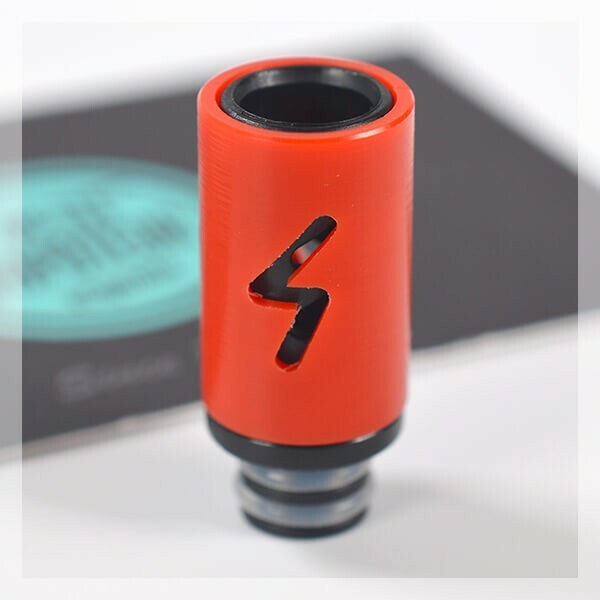 The drip tip is adapted for clearomisers and atomisers with the 510 Standard. Ne tient pas assez en place sur mon embout, tout plastique chinois. Pas top. "Le côté modulable est bien. Ne s’adapte pas parfaitement au niveau jointure, un peu de jeu." "Sympa avec son éclair sur toute la longueur"
"Très plastique et ne s'adapte pas bien a ma cigarette ikuu i80."